Dublin, 3 August 1980, an 8-year-old John Mullen gives a rose to Venerable Alvaro del Portillo who asks him to place it beside the tabernacle. The beatification of Bishop Alvaro Del Portillo today brings the prelate who succeeded the founder of the international lay movement Opus Dei, a step closer to canonisation though he only died in 1994. “It’s something unusual in the history of the Church to have a founder who is canonised and his successor is also. It’s a good sign,” according to Fr C. John McCloskey, an Opus Dei priest. Thousands of people have attested to the Spanish bishop’s kindness, warmth of smile, humility, supernatural courage, and the peace of mind his words inspired in them. The beatification ceremony is taking place in Madrid, where he was born on 11 March 1914 and where he lived with his parents and seven siblings. His mother was Mexican and his father was from Spain. While a 19-year-old engineering student in Madrid, Alvaro del Portillo took part in St Vincent de Paul activities, teaching catechism to children in Vallecas and other poor neighbourhoods, and distributing donations and food to needy families. At a certain point, thanks to one of his aunts, he came into contact with St Josemaria Escriva. After a few meetings, he felt that he was called to join Opus Dei, which was quite small at that time, with only five or six members. He joined in 1935. Later, encouraged by St Josemaría, he continued to carry out similar work with young people who were taking part in the early activities of Opus Dei in the city. After finishing his civil and ecclesiastical studies, he was ordained by the Bishop of Madrid, Dr Leopoldo Eijo y Garay, on 25 June 1944. He carried out his priestly ministry there until he moved to Rome in 1946. 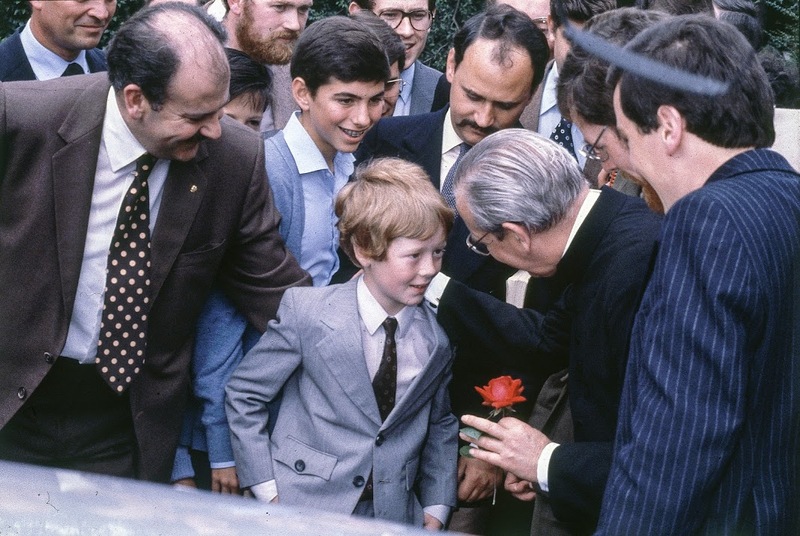 Rockbrook Park School in Dublin on 3 August 1980 – Venerable Alvaro del Portillo greets families. Following Pope Francis’s approval of the required miracle and the formal decree of the Congregation for the Causes of the Saints (5 July 2013), the Holy See confirmed in January that the Pope (at the request of the Prelate of Opus Dei, Bishop Javier Echevarría) had indicated that Alvaro del Portillo should be beatified in Madrid, the city where he was born on 27 September 2014. The beatification ceremony will be presided over by the Prefect of the Congregation for the Causes of Saints, Cardinal Angelo Amato. Faithful of the Opus Dei Prelature from all over the world are expected to attend. Bishop Javier Echevarría, Prelate of Opus Dei, will celebrate a Mass of thanksgiving the following day. Don Alvaro was very much involved in the Second Vatican Council, and even after he succeeded Escriva, he remained involved with the Vatican and continued to work there. According to Fr McClosky, he had a great deal of influence on a number of the documents from the Second Vatican Council. “There was a real friendship, and it says a lot that when Don Alvaro died, the Pope immediately left the Vatican and came to the headquarters of Opus Dei and to the chapel there in order to basically pray for a man who died the night before.” McClosky added that John Paul II didn’t go to the funerals of people who had died, but this was a friend of his, so he felt a debt to do that. McClosky suggested that two virtues of Don Alvaro’s that we can imitate are cheerfulness and being completely at the service of the Church. Bishop del Portillo made several visits to Ireland. His command of English was good. When he was very young, his mother got some help in minding the children from an Irish woman living in Madrid, and she was his first English teacher. The first occasion he visited Ireland was in 1952 when he came to meet the Archbishop of Dublin, Dr John Charles McQuaid, to complete the juridical formalities for the establishment of Opus Dei in this country. Lay members of the young organisation had arrived in Dublin in the late 1940s and the first Irish men and women had committed themselves to its work by 1950. 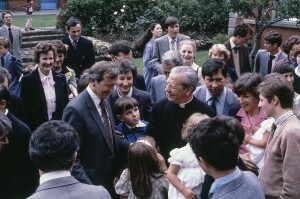 In 1959 Bishop del Portillo visited Ireland in the company of St Josemaría Escrivá. In the 1980s, after he was elected to succeed St Josemaría Escrivá, he came again on three occasions. On one visit, in August 1980, he visited the shrine of Our Lady at Knock, when it rained relentlessly. He remarked that since that was also the experience of the visionaries there in 1879, he felt it was entirely appropriate that he should share that same experience.